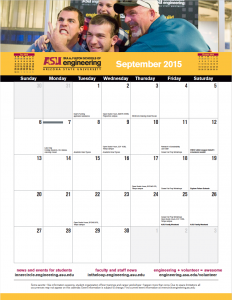 Save and print the September 2015 downloadable calendar. Save and print your Fulton Schools of Engineering calendar for September 2015! This free downloadable and printable calendar will be posted every month and customized with Fulton Schools events. For best results, print on 11″ x 17″ paper with the “Fit” option selected. Do you want your event on future calendars? Make sure you submit your event information to Inner Circle or In the Loop at least a month (or as soon as possible) before your event happens. Like this calendar? Share it with your friends.